The Newsletter Subscription extension integrates with MailChimp and CampaignMonitor, allowing customers to subscribe to lists of your choosing. There is a dashboard widget that displays recent subscriber activity and a widget for placing a signup form in the sidebar or any widget area. Additionally, this extension includes integration with MailChimp eCommerce360 tracking and uses version 2.0 of the MailChimp API. A MailChimp, CampaignMonitor or MailPoet account and the associated mailing lists of/for customers, depending on which you plan to use. Download the .zip file from your WooCommerce.com account. Go to WooCommerce > Settings > Newsletter. Select MailChimp as the Service Provider. Select whether box is ticked/unticked for Default Checkbox Status. 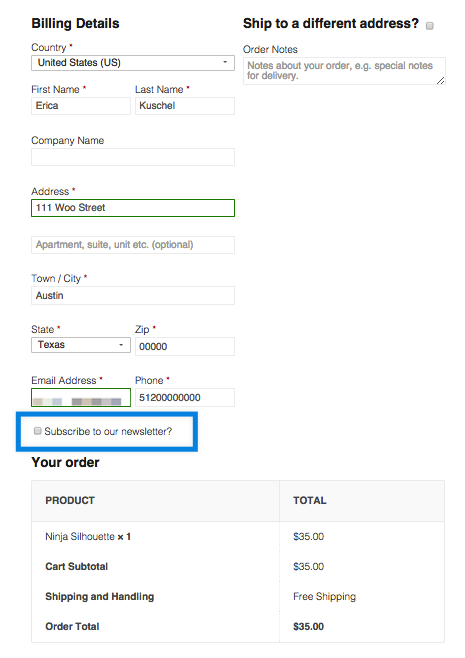 Enter preferred text for Subscribe checkbox label. 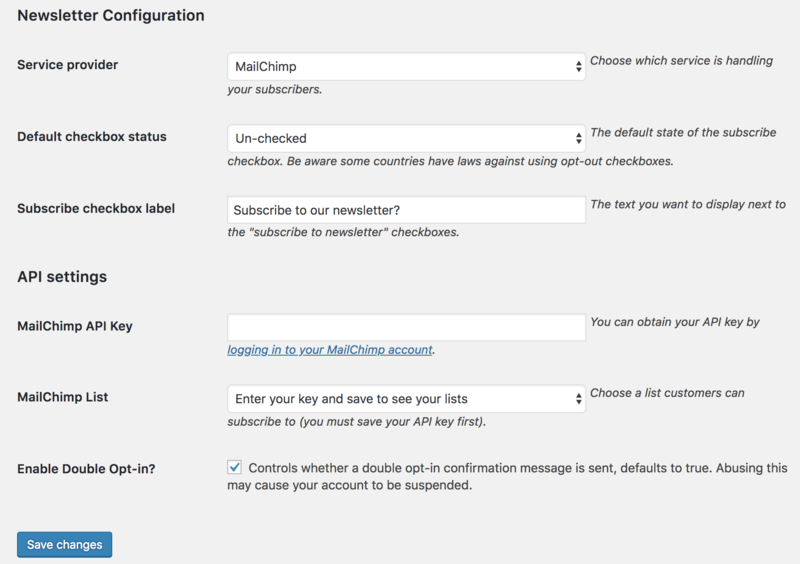 MailChimp API Key – Enter from your MailChimp account, and Save Changes. Saving enables your lists to be pulled for the next step. This extension works with MailChimp eCommerce 360. WooCommerce picks up these tracking links and reports sales via a hook on the Thanks page. Select Campaign Monitor as the Service Provider. 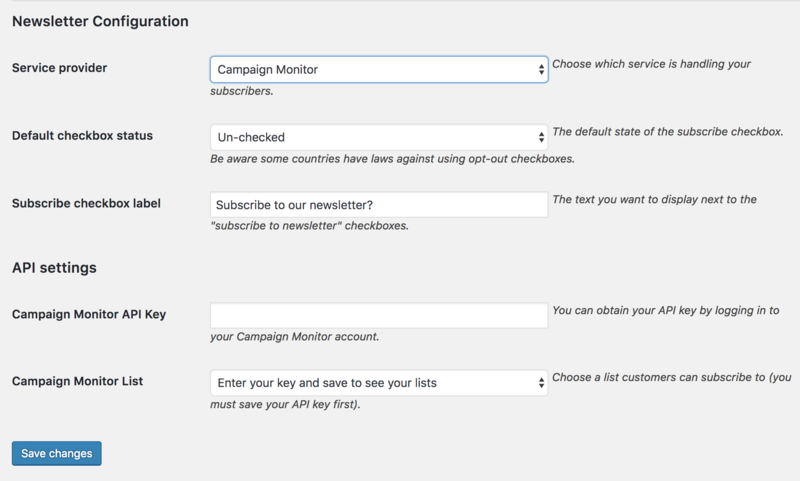 Campaign Monitor API Key – Enter from your MailChimp account, and Save Changes. Saving enables your lists to be pulled for the next step. Campaign Monitor List – Select a list for customers to subscribe to. The extension is not compatible with MailPoet version 3 yet. Go to: WooCommerce > Settings > Newsletter. Select MailPoet as the Service Provider. 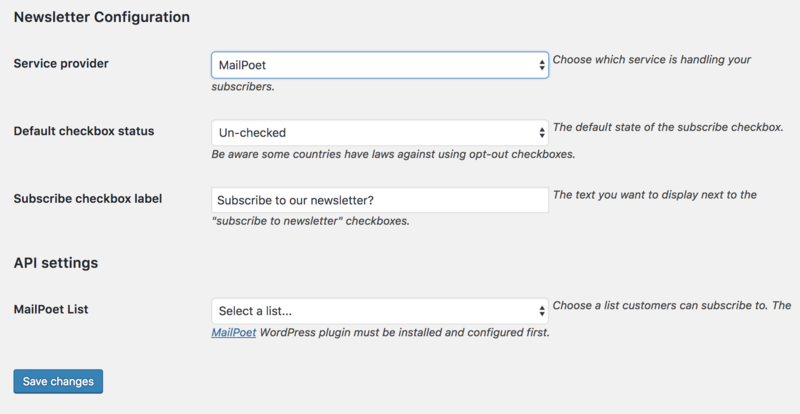 MailPoet List – Select a list for customers to subscribe to. Lists must already be set up so options can be pulled in. Users can check the box and when they place an order they will be subscribed. If using PayPal Express, the checkbox is shown when they return from PayPal.